Calls for Wells Fargo CEO John Stumpf to step down are getting louder. But Stumpf is likely to walk away with a fortune even if he's forced out over the national uproar about the creation of millions of fake accounts. Stumpf will leave with about $200 million -- made up of cash, Wells Fargo stock and options, a CNNMoney analysis has found. Even if Stumpf is fired "for cause," such as violating company policy, he would have to forfeit only a portion of that sum. Stumpf, 63, has been CEO since 2007 and was at the helm the entire time that the phony accounts scandal was taking place at the bank. Two weeks ago Wells Fargo was penalized $185 million in penalties and admitted to firing 5,300 employees for engaging in these shocking tactics. But the groundswell of pressure on Wells Fargo (WFC) and Stumpf has only grown since the scandal first came to light. Lawmakers called hearings at both the Senate and the House. The Justice Department has issued subpoenas to Wells Fargo. And on Thursday, Elizabeth Warren joined seven other senators in calling for a Department of Labor investigation into Wells Fargo's firing of the 5,300 employees. And late Thursday the San Francisco branch of the Federal Reserve said Stumpf had resigned from a Fed advisory board. No reason was given, but the resignation is effective immediately. A portion of Stumpf's bonuses were tied to increasing the number of customer accounts. An intense focus on adding new accounts, former employees say, led to a pressure-cooker atmosphere. In fact, filings show that in 2015, Stumpf received $4 million in awards for among other factors growing "primary consumer, small business and banking checking customers" that year. That linkage between pay and account growth surprised Jeffrey Sonnenfeld, an authority on corporate governance at Yale University. He told CNNMoney that "without a doubt" some of the CEO's pay linked to questionable sales tactics should be "clawed back" by the board. Wells Fargo declined to comment for this article. 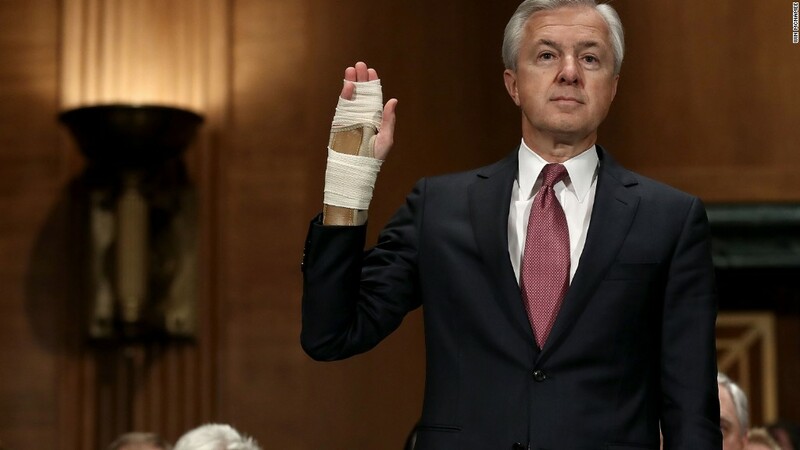 Wells Fargo also rewarded Stumpf last year for his success in "reinforcing a culture of risk management and accountability across the company." In fact, employees felt the opposite environment prevailed at the bank. Dozens of them reached out to CNNMoney to relay their horror stories. And a CNNMoney investigation uncovered at least half a dozen Wells Fargo workers who believe they were fired in retaliation for speaking up about improper sales tactics. "He should be docked," Sonnenfeld said. The Wells Fargo board has the power to do precisely that, whether Stumpf steps down or not. According to SEC filings, the Wells Fargo human resources committee has "full discretion to cancel all or a portion" of certain awards if the executive "takes imprudent risk or engages in misconduct in the performance of his or her duties." Clawbacks are also possible if the company suffers a "material failure of risk management." Much of Stumpf's $200 million haul will not come from a golden parachute -- the notorious compensation clauses that allow CEOs to collect millions of dollars when they are let go or after selling their company. 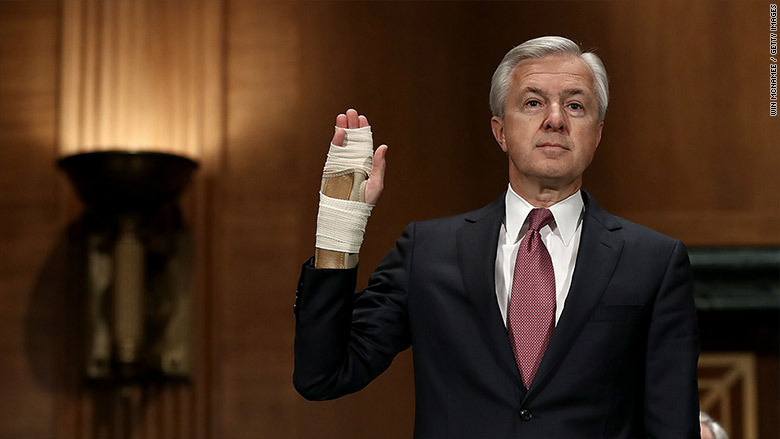 It's based on stocks, options and other bonuses Stumpf amassed during his three decades at Wells Fargo and its predecessor company. The compensation includes more than 1.6 million shares of Wells Fargo stock he owns outright. Those shares have a present value of about $74 million. He would also be due to receive cash and pension payments worth over $23 million, filings show. Stumpf has another batch of more than 3 million shares and options that he had yet to take ownership of as of the latest filing period. But Stumpf would likely be able to get those shares -- even if he left the company under pressure, filings show. The value of those shares have taken a hit in the face of the account scandal, with Wells Fargo stock down 9% over that time. But even at the current share price, those shares would be worth roughly $42 million after the payments Stumpf would have to make to exercise those options. Stumpf is also sitting on performance shares, stock awards and 401(k) units worth another $65 million. Stumpf would have to forfeit unvested restricted stock and performance shares if he were fired for cause. Analysts believe that outcome is unlikely at this point for Stumpf. If he stepped down voluntarily, or was pushed out, Stumpf's restricted stock and performance shares would vest either immediately or over the next several years because he is eligible for retirement, filings show. At Tuesday's Senate hearing, Warren scolded Stumpf for failing to fire senior management as he watched the company stock price go up.